Propane Regulator with Quick Disconnect. 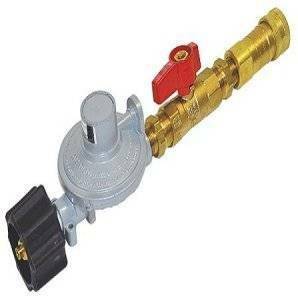 This Propane Regulator with Quick Disconnect is perfect when using a Portable Propane Fire Feature. With the ease of a quick disconnect exchanging out tanks and or moving your Fire Feature around is easy with this Propane Regulator. This Propane Regulator has a Valve to Control the Gas flow as well so you can adjust the flame to your desire. Let Outdoor Fire and Patio assist you with your next Outdoor Fire Feature.